I've seen marshmallow and toothpick construction around a bit on the internet, and we just so happened to have some mini marshmallows in the house, a bunch of toothpicks, and yet another rainy day on our hands. The marshmallows were just sticky enough, and firm enough and yet pliable enough to make really satisfying structures. I started with a tetrahedron (triangular based pyramid), and then a house, and then something else made from more triangles and satisfyingly symmetric. Miss 3 at first struggled to get the hang of it. 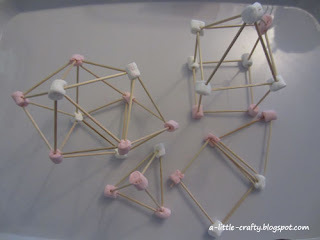 She managed to get a lot of cotton bud type constructions, and then, with a bit of help she made a 2-D house. With a bit more help she started on 3-D structures that (in Mr Crafty's opinion) didn't worry too much about the laws of gravity. Mr 5 instinctively started making things with lots of triangles, and had no problem building something big and fairly stable. He struggled more with not eating too many marshmallows. 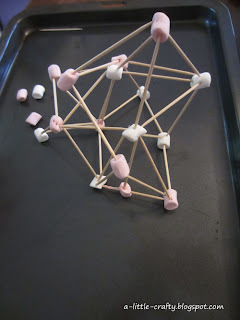 We kept the structures until after dinner, and then broke them up and ate desert at the same time.